Many years of experience with the Dampwood Termite in museum exhibits have gone into the design of this desktop version. 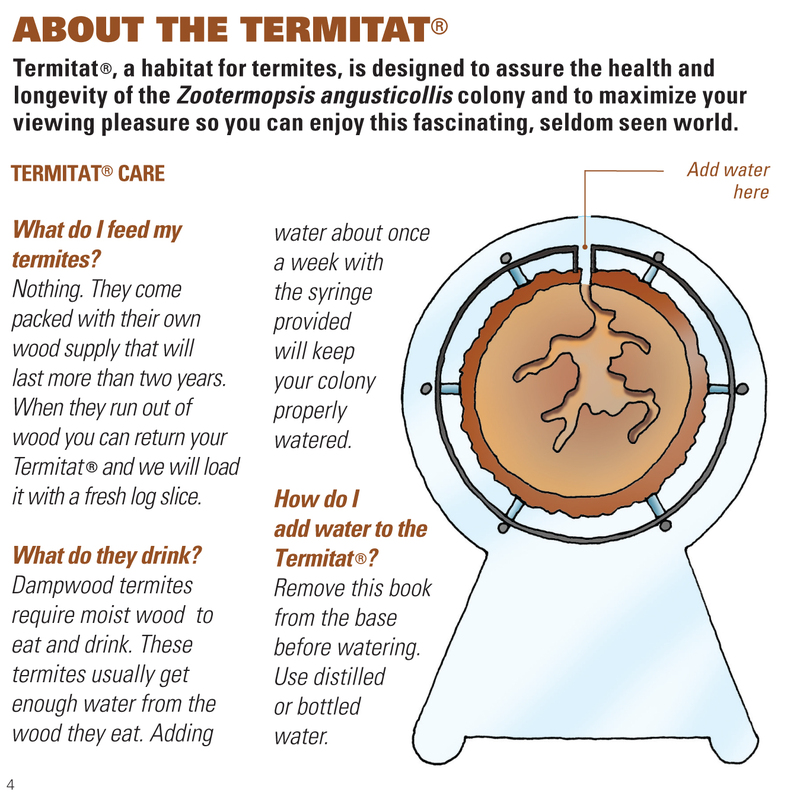 The Termitat is a beautiful, safe, yet simple way to observe the intriguing world of termites up close. It is designed to be secure and escape-proof using 1/4 inch thick acrylic and injection molded components for the case. The installed colony of live termites can live happily in their sealed yet visible world for years with the absolute minimum of care. Just add a small amount of water with the supplied applicator about every week and watch your own colony build, groom, feed, and communicate with each other. You will have years of pleasure observing their interesting social behaviors and progress with their built-in food supply. After the termites take approximately 2 to 3 years to consume the installed wood, the Termitat can be returned, and for a modest charge, it will be sent back with new wood and even a new colony if needed. The Termitat comes in two different styles and has optional accessories such as magnifiers. 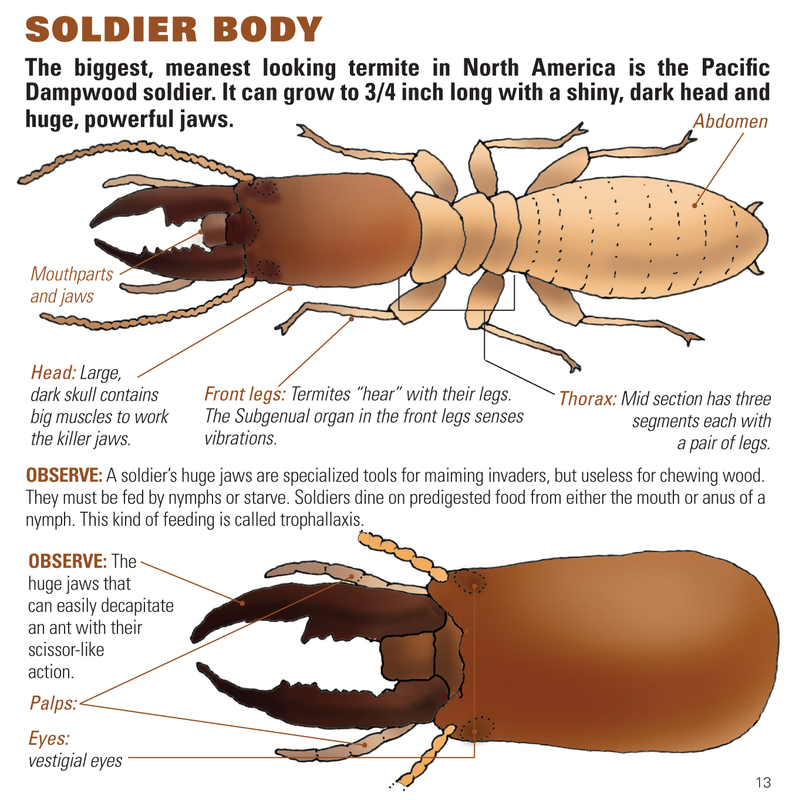 The soldiers are up to 3/4” long and along with the other colony members are quite observable with the naked eye. With the optional acrylic light-gathering magnifier or electronic USB 200X microscope, you can observe features such as the internal organs related to wood digestion and respiration and fascinating minute aspects of their body and behavior. There are over 2750 different species of termites in the world and 50 of those are found in North America. 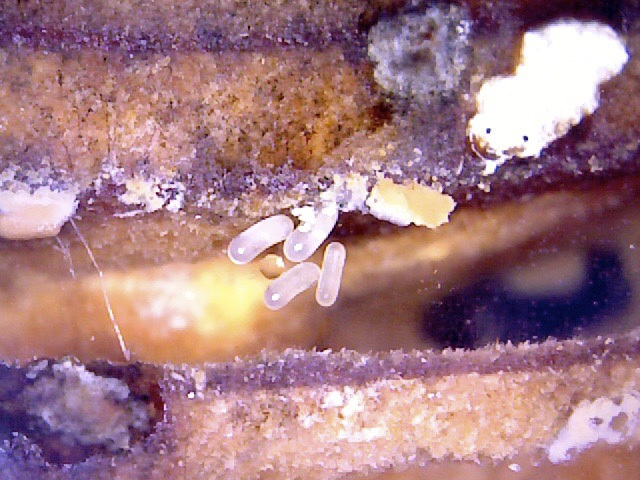 The largest, the Pacific Dampwood Termite, Zootermopsis angusticollis, is used in the Termitat. Permits are in place to allow regulated shipment of this low risk termite to most states in the US. It is not one of the subterranean or drywood termites which both account for almost all of the damage to wood structures in North America. Even though the Dampwoods have some “misbehaving” relatives, it’s time to take a really deeper look into one of the wonders of the insect world. There are amazing stories to discover among the millions of plants and animals on this planet. One of those stories is the fascinating one about termites. Did you know that termites use millions of microbes in a symbiotic relationship to digest wood into usable sugars and that this relationship has lasted 200 million years? 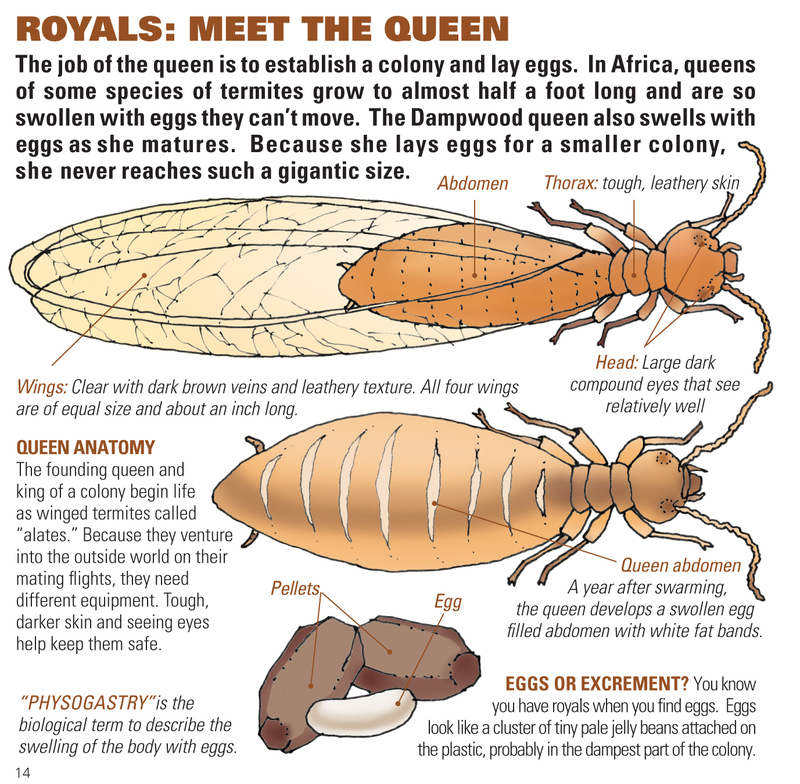 This information along with much more about termite anatomy, natural history, and social behavior is found in the comprehensive 32 page, full-color illustrated companion book. This book comes with every Termitat and will answer most if not all of the common questions about this fascinating, living, conversation starter. Click on the sample pages below for an expanded view. The species is very resourceful and capable of adjustments to the numbers and types of the colony members to maximize survival. These adjustments will happen over a few months time after you receive your Termitat. It will take this period for your colony to fully stabilize. The colony numbers will stay smaller in this closed system than in the wild as they seem to sense the size of the container and limit their population. Over time the colony will also produce supplementary reproductives. 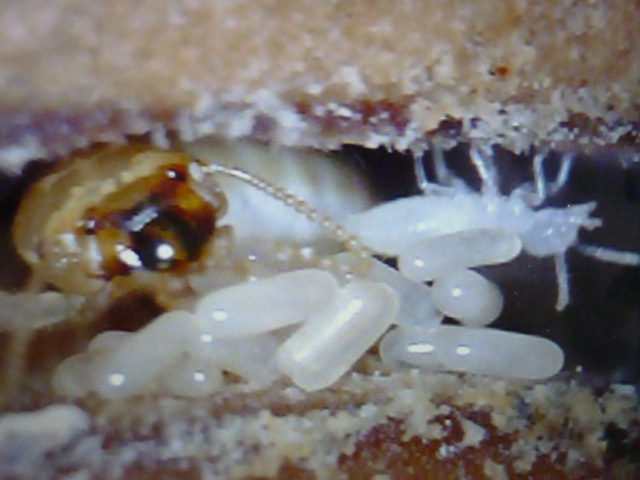 Look for eggs attached to the acrylic in approximately a month and a half after delivery of the Termitat. There is more on this process in the Termitat book.